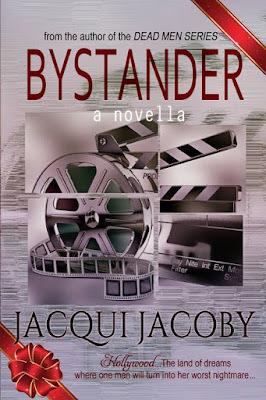 This week's Spotlight on Author is on Jacqui Jacoby and her latest release, Bystander. One kindle copy giveaway to one commenter! I have always loved Clive Cussler. Started reading him when I was fifteen. I haven't read one in awhile but I have met him several times and that was fairly awesome as it was he, through his work, who moved me toward action and suspense. The paranormal I added myself. Yes. Generally bubblegum rock: Bay City Rollers, Shaun and David Cassidy. The Monkees. I also have a Kinks play list I find it very soothing and some Who when I want to mix it up. I am a die hard Who fan. I do what I do the rest of the time. 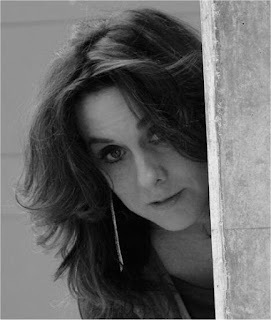 Writing is not merely a job to me. It's what I love to do. I generally work seven days a week, 6-10 hours days ... not because it's "work" about because it's what I love to do. I'm working with The Dead Men again and that is a great place to hang out. Bystander was a ride. I wrote the whole thing in just thirteen days in a rush of adrenaline that felt amazing. The story, the characters, they all took shape out of people and places I knew from the past. The image of a stalker was deeply dark to me and deviling into the research to make him bad, exciting. Picking the crew to slow him down equally as much. 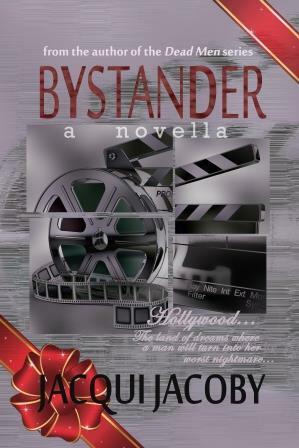 Bystander is the story of Beth Hardwick, reader on the Snap Shots set in Hollywood, California. Just out of a bad relationship with Mile Criswell, she thought he would disappear and she could move on. Miles had serious other plans. It took the involvement of her boss, former spot light hot shot and current Snap Shot producer to step in and rescue her. Sean, world famous for his dating as well as his movies has two passions in his life: his son and his cats. And the way the cats boss him around, you would think they ruled the world. Thanks Kelly!! Sure am having fun. I can't get over you finishing a book in 13 days. Yeah, sorta took me by surprise, too. Was amazing fun. Hi Nas. Hi Jacqui. 13 days. Must have been some adrenalin rush !! Sounds amazing!! Thank you. It was. Bounced ideas off the spouse, did research as I went and and ... wrote it. Glad you could drop in and read the interview! I'm more comfortable with animals too. I have lots of online friends but no real like friends, just a few family members. Congrats on the new book. Thank you, Mary. I'm the same way. I like cats. You can count on them. Love a good story that includes bossy cats! Sounds great. I like your answers, Jacqui! That's great that writing is both a job and a way for you to relax. Congratulations on the book! Enjoying what you do is important, I think. Thank you. Congrats to Jacqui. I haven't read Cussler yet, but I do enjoy The Who. Congrats, Jacqui! I agree--how can it be work if we love it? I write ten hours a day sometimes and I've been called a "workaholic." I prefer to refer to it as a "writeaholic!" Good title. I do it with a timer set to 45 minutes one, then 15 off. Then I move some. Good luck. Hi Jacqui. Nice to meet you. Your new book sounds fascinating. And it has cats, which makes it a winner. Congratulations. Best of luck to you. The cats wandered in, wanted names (provided by my son) and then they took up residence. I get a lot of research on this one. Love the idea of writing in a frenzy of inspiration. Congratulations on your new book! I cannot imagine writing a book in 13 days. Makes my current pace feel like a snail's pace for sure! Wow! Congrats to Jacqui! That's pretty fast to write a book. Happy New Year!